Spice Boxes - Specialty Drawers - Susquehanna Valley Woodcrafters, Inc.
Dovetail spice boxes offer a great way to maximize space. Choose from a variety of designs that can be made to fit just about any opening. Dovetail spice boxes are custom made to be mounted on the back of a door, or you can install as a roll out in a base cabinet. See our dovetail spice box selection below, then contact us for a quote on your next job! This unit can be used as either a spice or can box (rack) and is designed to be hung on a door or used as an upright rollout. to keep from puttying dovetails, a fraction of 3/4” is recommended. The bottom thickness is 1/2” (designed to be flush with the bottom sides). Adjustable shelves are used to divide the spice box into horizontal sections. Two (2) rows of 3mm diameter holes are drilled on each side (inside) of the box. The holes are referenced from the center of the box and are drilled in both directions (in increments of 32mm). the top front of each shelf is routed to accept the 1/8” thick plexiglass front. 4 metal pins are provided with each shelf. 2” high plexiglass front that goes the full width of the box. same material and thickness as the box sides. 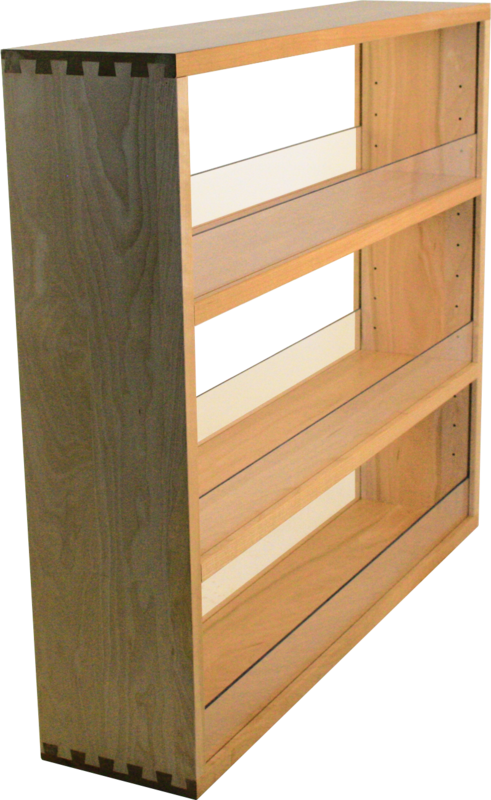 This unit can be used as either a spice or can box (rack) and is designed to be used as an upright rollout. The design allows for access from both sides of the unit. Each shelf runs through the unit and has a plexiglass front on each side. 2” high plexiglass front that goes the full width of the box on both sides. The following shelf prices are in addition to the standard box price. Each spice box includes plexiglass for the bottom shelf. If the spice box depth is over 40”, a fixed center shelf will be installed. There is a center divider in the unit, so each shelf does not go through the unit. There are shelves on each side of the center divider which can be located independently. Shelf prices are in addition to the standard box price (see “Double w/Div.” pricing).